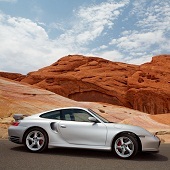 Founded in 1972, the Las Vegas Region Porsche Club of America has been very active ever since. We now have well over 400 members and run a number of events: driver education track events, social, charity, family, club races, tours, fun-runs, rallies, tech sessions, time trials, concours and autocross. 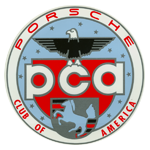 In 1973 about 15 Porsche owners arranged an organizational meeting at the public library then located on East Flamingo to begin the process of rounding up the 25 signatures necessary to apply for a PCA region charter. In June, 1974 the charter ceremony was attended by several national PCA officials. Activities included a social at the home of Carl Young, cocktails and dinner at the Showboat, an autocross, and a poolside get together in the afternoon. Volker Gurr was the first Las Vegas Region President. In late December '74, a contest was held to choose a name for the monthly newsletter. Doug Moir won with the name "Sandscript." The monthly newsletter first appeared as the Sandscript beginning with the February '75 issue. Carl Young was one of the original Founding Members of the Las Vegas Region. 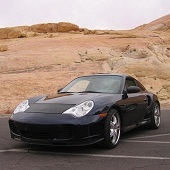 He was also the Las Vegas Region Porsche Club Historian for many years. In addition to holding the office of Club Historian, he was also a past President and very active as Driver's Ed Chairman. 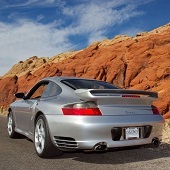 A retired US Air Force fighter pilot, Carl owned and operated the Porsche Service Shop "Carl's Place" and was thus well known throughout the area. Carl was active in many forms of motorsports events. 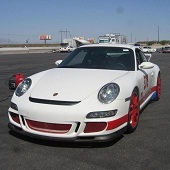 In 1999 Carl Young drove the Silver State Classic Challenge and his wife Ellen navigated for a First Place finish in the 165 mph class, missing the 165 mph target by just 104 TEN-THOUSANDTHS of a mile per hour. 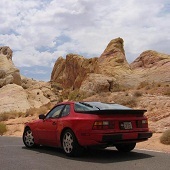 Carl Young drove a 1996 virtually stock Twin Turbo except for safety-related upgrades such as a full roll cage, fuel cell, and fire system. 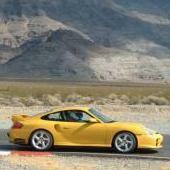 He averaged 164.9896 mph over the desert course.